The Outback Savannah Dog House has an old Georgia colonial style to it. 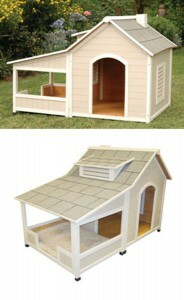 Built like a traditional A-line house, this outdoor dog house also comes with a built in porch. This is especially nice in more humid regions as the porch provides a cross-breeze to keep your dog comfortable as well as a protective overhang so that he or she can enjoy the shade. Made of solid wood, its wooden construction acts as a natural insulator. Wood is thermal-efficient, which means it stays warm in the winter and cool in the summer. It doesn't absorb heat like steel or plastics can, making the inside of the house stifling to be in. Plus, it has a weather-resistant sealer painted onto the wood to keep it lasting longer without succumbing to rotting. Its naturally one of the best materials for a dog house. The house is fitted with two slotted windows which keeps the elements out, but provides a comfortable air flow around the inside of the dog house keeping it fresh, cool, and most of all, dry and free of mold. The roof has asphalt shingles on it to keep it from leaking and offering more protection for your dog during rainy times. But most of all, I like its classy style. Its one of those dog houses which is fun to have in your backyard. I've talk to tons of people who think this mini house is just adorable. Its also a really nice house if you live in a hot or humid area, as this house will provide your dog with the shelter and comfort he or she needs during the summer. A really smart buy!